During summers in Bhatkal (Karnataka), every morning we were treated to Raagi-neru. A watery concoction of raagi ground with a bit of coconut and jaggery. My grandmother advised that this would keep our insides cool from the summer heat. We’d hurriedly gulp a few glasses and dash into the orchards, chasing dragon flies! I recently saw two recipes for Raagi Roti (or Bhakri) and convinced M to give it a try. 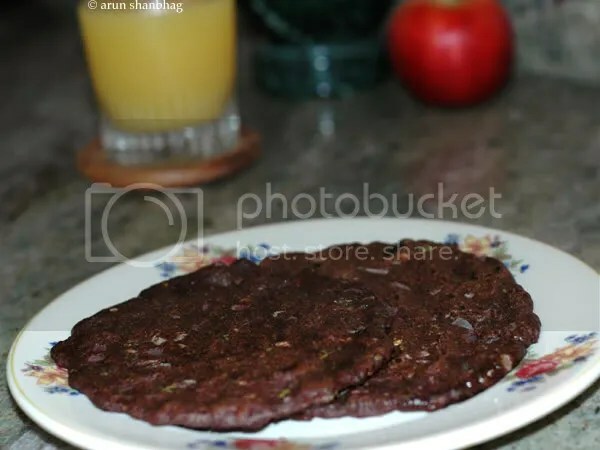 We followed two similar recipes; one by Latha from Yum Blog! and the other by Asha of Foodies Hope. There are slight variations, so go ahead and check them out.The bhakri had a nice earthy taste and was slightly gritty. The red onions and chillies gave it a nice zing and did not need any chutney to go with it. It did dry my mouth, and I gulped a couple of glasses of water and juice. I quickly chomped down two bhakris and was surprisingly full for the rest of the day. It sits strongly in your stomach. This ability to fill you must be an important reason why raagi is a staple amongst the poor laborers in Northern Karnataka. This would be a great snack to power you on a long hike. Mix ingredients in the least amount of water and knead into a smooth soft dough. Spread a few drops of oil on a hot tava (pan), place a ball of dough and pat it to a pancake. Try to get it as thin as possible. Flip and roast other side as well. Don’t crisp, but leave soft. A little background: Raagi is also called African millet or red millet, and was introduced into India four millenia earlier from Ethiopia. In Maharashtra it is called Nachani and in Konkani, we call it Nanchano. The raagi crop grows well in arid lands making it popular amongst farmers in parts of the dry Deccan plateau. The seeds once harvested are also resistant to insects and spoilage and another reason raagi has become a staple of farmers. And it unusually brings vital amino acids to an otherwise starchy diet.Give it a try! Eat Healthy! Thank you for sharing your variation and that your girl loved it; It is so nutritious that it is perfect for the kids. Hey, I recently started reading this blog – thank you for the good work. I wanted to inform you that it’s not displaying properly on the BlackBerry Browser (I have a Storm). Anyway, I’m now subscribed to your RSS feed on my home PC, so thank you! You should try Nachani laddoos!!! They’re fab! also, these days you get nachani chips…another fav! Thank you! I have heard about those. Can you get me a good recipe for nachani laddoos? Would love to try it. First time here….nice space….Sounds nice & easy recipe….I’ll surely give it a try….got some ragi flour, need to be used up as my little one doesn’t eat any more of that stuff…have been putting little bit here & there in different preparations but as a roti never tried…let me try today itself….. Thank you for visiting and your kind comment. Yes, it is an easy recipe, but have to caution you, it is a hardy, chewy bhakri and very filling. Plan on just one per person for starters. But these keep very well also. Sir I m very much happy to read about a ragi . At present I m in Bhopal and I had searched it all over in bhopal but i did not get it. Fortunaitly you also stay in bhopal. Please send me message at my email ID sawardekar.ganesh@yahoo.com I will be very much happy to talk with you. If you need to purchase Raagi, Please contact Mr Ramnath in Kumta who can help you. Raagi is very nutritious and I recommend it highly. Oh, Thank you Indo Curry! Glad you liked the additions to the traditional bhakri! I noticed in Northern Karnataka that the laborers would make the plain ragi bhakris and eat it with lotsa garlic chutney! Yumm!